On May 30, 2013 I am boarding the Silversea Silver Shadow for a one week Alaska cruise from Vancouver to Seward and then onto Anchorage via the included Alaska Railroad domed wildlife viewing train. I know that this may not be the perfect time to visit Alaska and a mere week on a cruise seems all to short, but with a busy schedule this cruise was the best fit for my purposes. My purposes, you ask? I am doing my job here! Silversea has been working hard to improve the consistency of its luxury cruise product and the time has come for me to see first-hand how things are going. 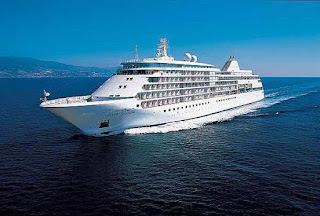 Having been to Alaska on pretty much the same itinerary in reverse on Regent Seven Seas Mariner a few years ago, cruised on the Crystal Symphony on the West Coast even more recently and having an intimate knowledge of the Seabourn ships, there are going to be a lot of comparisons. But there is also going to be a focus on what Silversea delivers that is unique; what distinguishes Silversea from the pack. 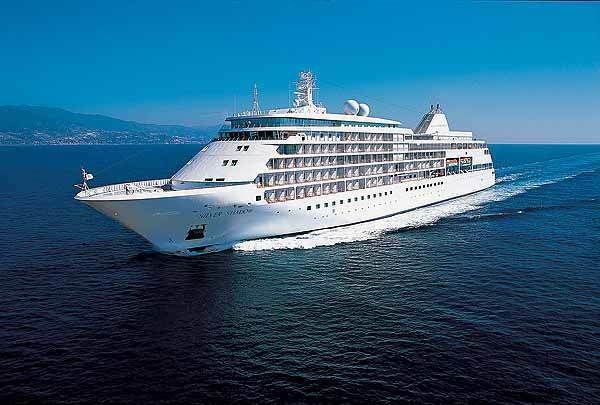 The Silver Shadow was built in 2000 and sails with 382 guests and 302 crew. The ship is all-suite with the majority of the suites having private balconies (there are a few Oceanview Suites and even fewer Terrace Suites that share a large balcony). I will be sailing in a Veranda 3 Suite on Deck 6. Note: While there will be some differences, I did a ship inspection of the Silver Whisper, the Shadow's sister ship, two years ago and am providing some photos of her here for context. During my cruise the photos will only be from the Silver Shadow. to the Pool Grill (and its popular Black Rock Gill "hot rocks" concept). My goal is to dine in each venue (though, honestly, the Black Rock Grill - if it is warm enough to be offered - may be given a miss...just a personal choice). The public areas on the Silver Shadow are more traditional as is her styling as the ship is thirteen years old. That is not necessarily a bad thing, as I do enjoy the warmth of wood as well as the recognition of the fact that you are actually on a ship with a bit of maritime heritage. As Alaska is rich in natural history I am also very interested to see how Silversea's enrichment program pans out. Silversea let's you know who the scheduled enrichment lecturers are well in advance. There are two on this cruise, but neither appear to be specialists on Alaska...but you never know how close the "blurb" about them reflects their knowledge or passion. OK, so what is the itinerary and what do I have planned? Having been on a similar cruise once before, and my primary purpose of this cruise is to "use the heck out of the ship", I have not planned too many shoreside activities. That said, Silversea has a very impressive list of shore excursion offerings in each port (especially for the number of guests) and the prices are extremely reasonable. Also, having just been in Iceland this past February and been up close and personal with glaciers and ice walls, I don't feel compelled to engage in the same sort of activities here. So let's see how all this goes. I am, most certainly, looking forward to this experience. And you should look forward to my honest and candid comments! And if it inspires you to try Silversea, whether sailing in Alaska or somewhere else in the world, give me a call at (877) 2GO-LUXURY or email me at eric@goldringtravel.com.